Despite the modern advances in wound closure techniques and devices, there is a vital need for newer methods of enhancing the healing process to achieve optimal outcomes. Wound healing is a complex sequence of intracellular and extracellular events regulated by signaling proteins. This process is, at present, not completely understood. One of the promising, but complicated areas of recent therapeutic development involves topical application of growth factors to enhance the normal healing process. 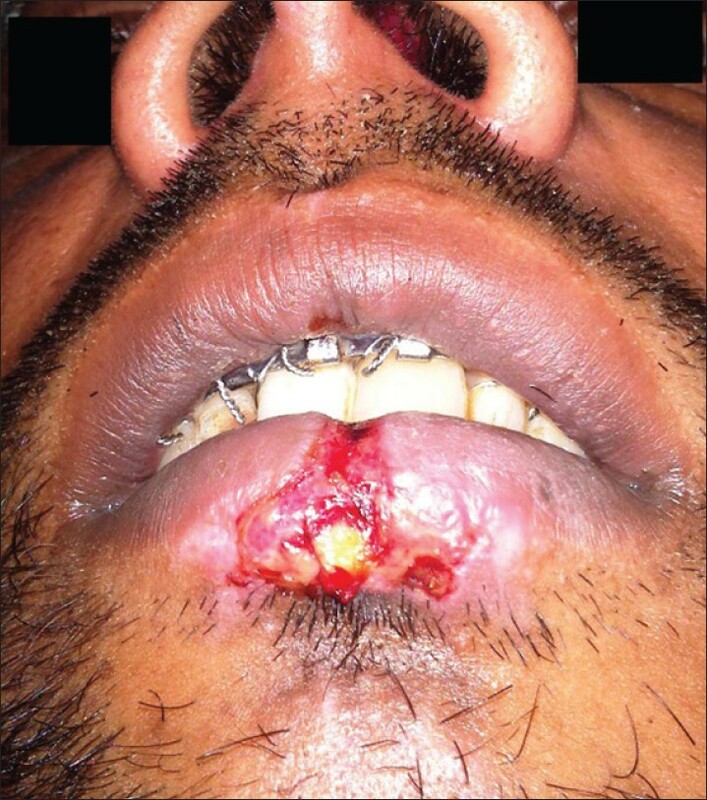 This case report shows an innovative technique of enhancement of healing of skin wounds by local application of platelet-rich fibrin (PRF) as a biological dressing. 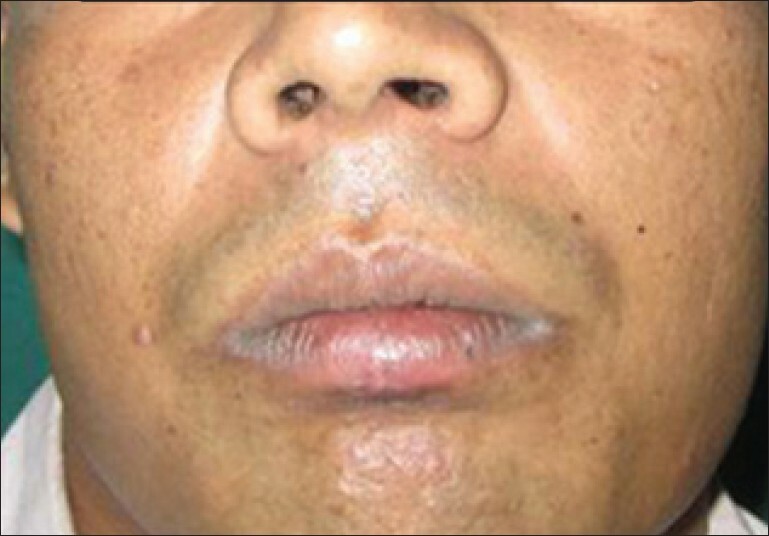 A 30-year-old man who suffered a motorcycle accident, reported to the Department of Oral and Maxillofacial Surgery, presenting with an avulsive wound, approximately 0.5 × 1 cm in size, on the lower lip in the midline region with a disruption of the vermilion border and a white roll [Figure 1]. The depth of the wound was uneven with muscle tissue loss in some regions. The patient had no medical history. Primary closure could have caused pouting of the lip. Healing by secondary intention could have resulted in fibrosis and development of a hideous scar. Therefore, it was decided to treat the defect by local application of a PRF membrane. About 10 ml of venous blood was withdrawn to prepare PRF by Choukroun's protocol [Figure 2]. The sampled blood was transferred into glass test tubes. It was then centrifuged at 3000 rpm for 10 min in a laboratory centrifuge. At the end of the centrifugation, three distinct layers could be seen in the test tube. The uppermost layer was platelet poor plasma, the middle layer was platelet rich fibrin, and the lowermost layer was red blood cells. The middle layer of PRF was separated and squeezed between two layers of sterile gauze. The PRF membrane thus obtained was placed over the defect [Figure 3]. A double layer of the membrane was placed over deeper areas of the defect to achieve an even surface. 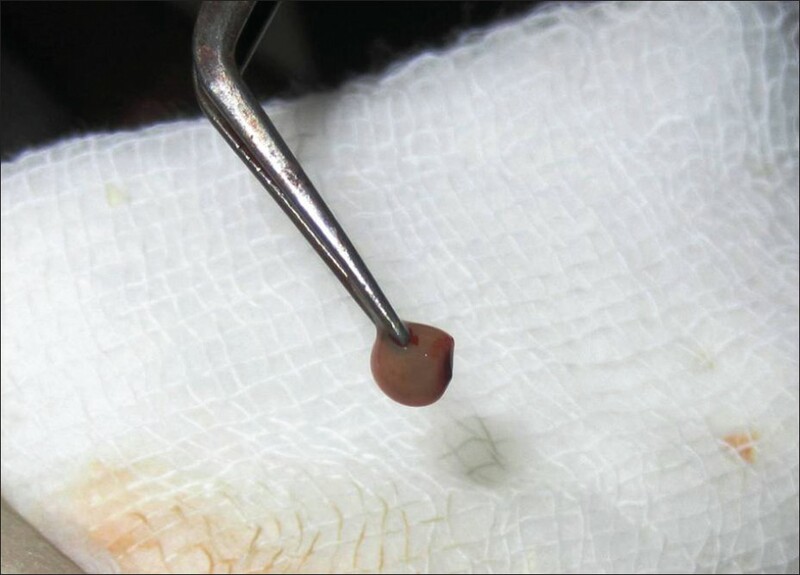 Neglecting this step could lead to an uneven surface and formation of a scar on healing; this was covered by a single layer of moist gauze and micropore dressing. A gradual decrease in the size of the wound and granulation tissue formation was observed in the subsequent visits [Figure 4]. There were no signs of inflammation or infection. It was observed that the PRF-treated site showed hastened healing with early wound contracture. In the subsequent visits, the color of the reconstructed region was comparable to the adjacent uninjured tissue. The defect in the vermilion border and the white roll was inconspicuous [Figure 5]. 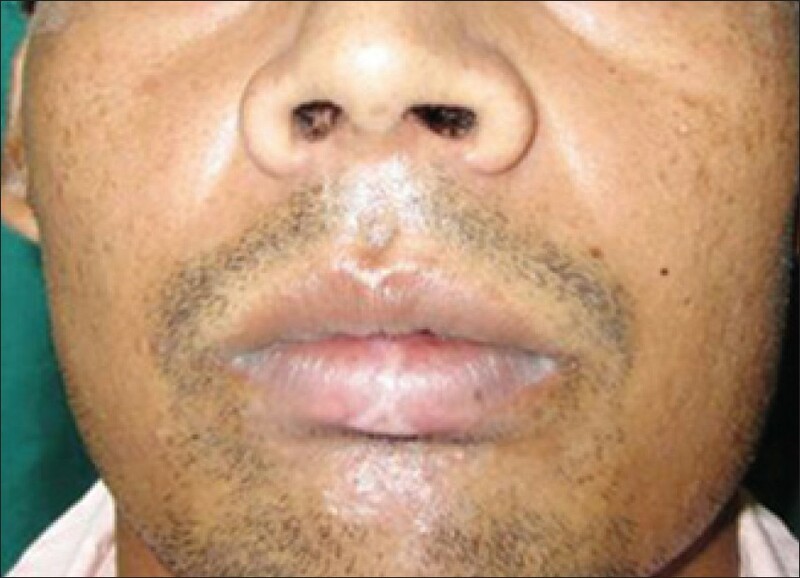 Face being a highly aesthetic zone, the complexities in healing after any intervention poses a great challenge to the surgeon. Scar formation is one of the most undesirable outcomes of the healing process. Early primary closure helps minimize scars, but in cases where there is skin loss, it is not always achievable. This is true, especially in areas where undermining the adjacent tissue is not possible or it may distort facial symmetry. Any avulsive wound gets covered with a blood clot. This clot is the focal point of initiating healing. A natural blood clot contains 5% platelets, 95% red blood cells, <1% white blood cells, and large amounts of fibrin strands. A platelet-rich plasma (PRP) clot contains 95% platelets, 4% red blood cells, and 1% white blood cells. PRP is a first generation plasma concentrate. Due to the various advantages of PRF over PRP and the ease of technique, PRF is preferred over the latter. PRF membrane is a simple approach of concentrating platelets or enriching natural blood clot, which forms in avulsive wounds, to initiate a more rapid and complete healing process. Since the healing that occurs by using this technique is neither by primary intention nor by pure secondary intention, we have termed it "modified secondary intention healing." The efficacy of this treatment lies in the local delivery of a wide range of growth factors and proteins on a fibrin mesh, mimicking and supporting physiological wound healing and reparative tissue processes, thereby resulting in a nearly scarless aesthetic wound healing. 1. Dohan DM, Choukroun J, Diss A, Dohan SL, Dohan AJ, Mouhyi J, et al. Platelet-rich fibrin (PRF): A second-generation platelet concentrate. Part II: Platelet-related biologic features. Oral Surg Oral Med Oral Pathol Oral Radiol Endod 2006;101:e45-50. 2. Eppley BL, Pietrzak WS, Blanton M. Platelet-rich plasma: A review of biology and applications in plastic surgery. Plast Reconstr Surg 2006;118:147e-59e. 3. Blanton MW, Hadad I, Johnstone BH, Mund JA, Rogers PI, Eppley BL, et al. Adipose stromal cells and platelet-rich plasma therapies synergistically increase revascularization during wound healing. Plast Reconstr Surg 2009;123:56S-64S. 4. Hom DB, Linzie BM, Huang TC. The healing effects of autologous platelet gel on acute human skin wounds. Arch Facial Plast Surg 2007;9:174-83. 5. Sunitha Raja V, Munirathnam Naidu E. Platelet-rich fibrin: Evolution of a second generation platelet concentrate. Indian J Dent Res 2008;19:42-6. 6. Choukroun J, Diss A, Simonpieri A, Girard MO, Schoeffler C, Dohan SL, et al. Platelet-rich fibrin (PRF): A second-generation platelet concentrate. Part IV: Clinical effects on tissue healing. Oral Surg Oral Med Oral Pathol Oral Radiol Endod 2006;101:e56-60.